MY BOOK IS DONE!!!!!!!!!!!!!!!!!!!!!!!!!!!!!!!!!!!!!!!!!!! 100,702 WORDS, 246 PAGES!!!!!!!!!!!!!!!!!!!!!!!!!!!!!!!!!!!!!!!! so, it's been like forever and a day since I actually posted something. oops. just got done with the first round of Christmas baking, four double batches of cookies in two days. I hurt. but I got it done. I have done it! 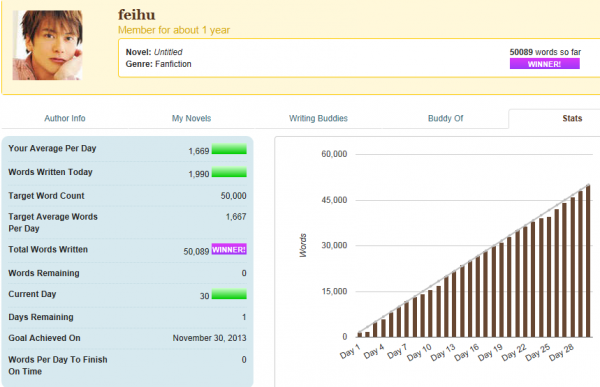 I have finished my NaNoWriMo book! Final word count is 65,930. CONQUEST IS MINE!! Let's just not talk about how I'm nowhere near done with the story. I remember a while ago I said I would start posting recipes and never did. I blame the fact that lj no longer likes internet explorer and has made the enter key totally non-functional. You can scale back the amounts of pasta used in the dishes I make if you like, I use a lot because then it lasts for more meals, since I do my cooking for work. I think I'll just do these two for now. Next time, stir fry, chicken pot pie stew, and beef noodle soup. The beef noodle soup is not yet tested, so I can't tell you until I try it. Well, it's two days late, but here is perkyandproud's brithday present.